An important first step in managing forest roads is to perform a survey to identify sources of erosion and hydrologic hazards such as undersized culverts. With this information, land owners and managers can prioritize maintenance needs and restoration opportunities. Without such information, roads can fail – causing environmental damage and an expensive fix. A new approach to measuring road erosion and hydrologic hazards has been developed by the US Forest Service called GRAIP. The Geomorphic Roads Analysis and Inventory Package (GRAIP) combines a road inventory with a powerful GIS analysis tool set to predict production and delivery, hydrologic connectivity, landslide and gully risk, and stream crossing failure risk. GRAIPs helps determine the overall infrastructure condition with identified erosion points. The method is rapidly being adopted by forests around the western US. For more information about GRAIP read our review on road restoration we co-authored with the Forest Service developers of GRAIP. In 2017 InRoads Consulting surveyed the Sunlight Basin for the Shoshone National Forest. We surveyed the watershed using the GRAIP protocol, ran the model, and interpreted results. Sections of roads that produced the most sediment were identified and the amount of sediment delivered to streams was quantified. Additionally, the amount of sediment accumulated Sunlight Creek was modeled. To view the full report click here. An example of GRAIP output. Often, less than 10% of the road system contributes 90% of sediment delivery. The Nature Conservancy’s Clearwater-Blackfoot Project (CBP). We have inventoried the roads and culverts on more than 1,200 miles of roads on 100,000 acres of former Plum Creek timberlands in western Montana as part of The Nature Conservancy’s Clearwater-Blackfoot Project (CBP). A priority of the CBP is to assess the road system and identify opportunities for mitigation and restoration. 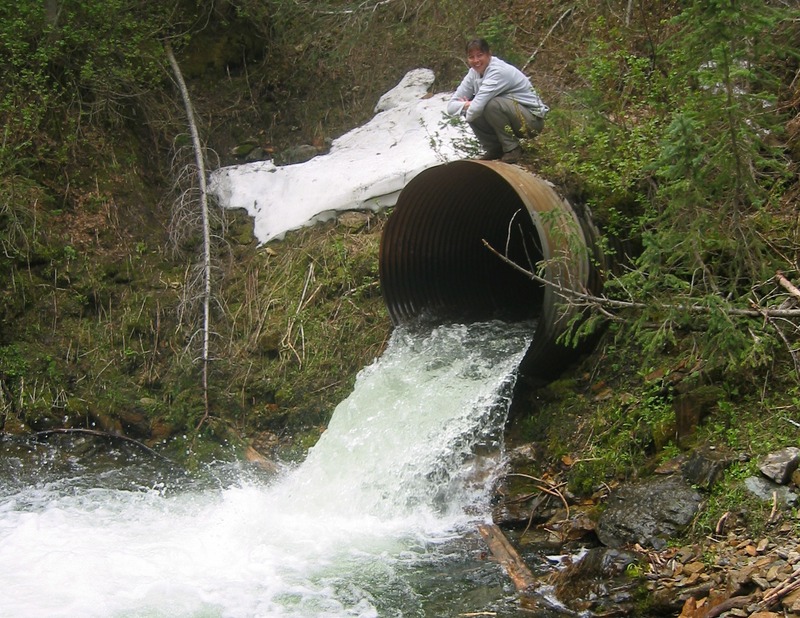 We identified problems with drainage, landslide hazards, and erosion; assessed stream crossings including stream habitat characteristics and culvert measurements; and identified noxious weeds along roads and stream crossings. All data was entered into a geodatabase where hotspots and BMP needs can be quickly queried and used for implementing projects on the ground. Currently we are helping manage these roads by ongoing assessments and on-the-ground restoration. Below is a screenshot te geo-database we developed of roads and culverts inventoried on CBP lands. Green dots are functioning culverts, orange dots need BMPs, and red dots are “hot spot” culverts.